We have seen the good, the bad and the indifferent, as it relates to questionnaires. The good ones always include: Obvious headings, clear instructions as to what should be done to complete the questionnaire, concise questions, and most importantly, the questions asked, should adequately address the hypotheses being tested – the main issues or problems being examined.We have seen – too many times – completed questionnaires entered into statistical software, which fails in the simplest way, to answer the main purpose of the study. 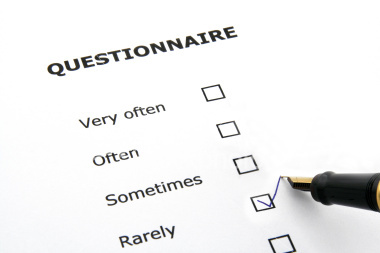 These shortcomings of the questionnaire are generally very apparent at the analysis stage, when the researcher realizes that what he had hoped to accomplish from the data were not specified as questions on the questionnaire. As strange as it might sound these things do happen, and more often than you think!! So be extremely careful in the initial stages of a research, when you are preparing your proposals and outlining your purpose. Seek assistance with the questionnaire design once you are uncertain about it’s effectiveness in providing the required answers to your problems (hypotheses). You should also be cognizant of the specific statistical methods you will utilize in the analysis of your data from the questionnaire design stage. This will increase your productivity and efficiency by limiting the amount of data transformations (recoding, grouping, scaling etc.) needed to run your analysis. We have seen too often, cases where individuals complete their data collection with the intention to use parametric methods to analyze, without being aware of the assumptions of the parametric method (data must be normally distributed, large enough sample size etc.). This is a frequent occurrence observed by the Balcostics Group, and we believe that the problem can be mitigated by consultation. Some amount of consultation with an expert, from the questionnaire design stage can prove highly beneficial in terms of time and money saved. It can reduce the amount of time used doing manipulation on the data, and most importantly, it can saved you from re-doing your research!! Finally, please ensure that you do a pilot study. Such a study will highlight most, if not all, the shortcomings of your questionnaire so you can improve and make changes prior to officially starting your data collection. We look forward to your comments and views on this post.